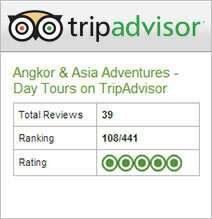 Angkor & Asia Adventures Travel ( AAA Travel & Tours ) is a travel organization and tour company based in Cambodia with over 10 years experience in running tours and making travel arrangements for clients from all over the world visiting a wide range of destinations in the country as well as across South East Asia. We have extensive local knowledge and a strong local network of service providers as well as a team of very experienced staff who focus on ensuring that each client receives the highest level of service and has the best possible experience during their holidays. We are always on the look-out for organisations in other parts of South-East Asia who would like to partner with us and share our knowledge and experience to provide clients the most outstanding visits to this part of the world.